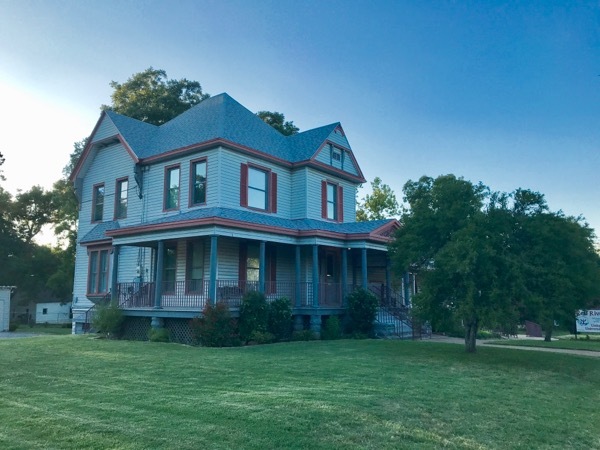 Located just north of historic downtown Denison and only 8 miles south of the Red River and Oklahoma, our church home and campus is on the corner of North Burnett Avenue and Bond Street. Our building is a blend of the original early 1900’s Victorian mansion and the attached 1960’s era chapel. A sweeping veranda wraps around the front and side of the house offering a pleasant spot to sit and enjoy the views. We think the original house was built around 1900 as a wealthy single family residence. We don’t know anything about the original owners. We do know that originally the house used the basement for the servants quarters and it contained the original kitchen. The back stairs provided access to all floors so that the servants could go up and down without bothering the owners. We now use the space for storage. 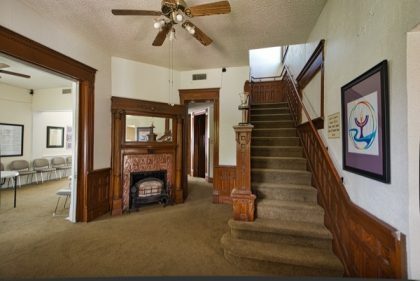 The first floor has a grand foyer with a fire place and oak paneling that runs up the stairs. Behind double sliding doors was the living room, now the Clara Barton parlor where we hold the adult forum and have Conversations & Calories (our answer to coffee hour). Connected to the Barton parlor is the Emerson room (the original dining room) with it floor to ceiling bookcases. There is one more room on this level, perhaps originally a bedroom or a library. For us, it is the Soul Café, a servery rather than a full kitchen equipped with an oven, microwaves, coffee makers and two dish washers. It is also the hub for our 16 channel video surveillance system. The second floor, originally four bedrooms and a full bath, now house the F. Church Library, Susan B. Anthony room, Arts & Crafts room along with the church office. The chapel was added in the 1960’s when the house was used as a funeral home. We sold the pews to an Anglican congregation and replaced them with comfortable chairs, converted the ‘viewing room’ into two accessible restrooms for all people along with a lobby outside the chapel. Our church campus is just over half an acre, and contains a newly installed play ground next to a series of four attached garages (that used to store caskets). The various gardens are the home for our Monarch Waystation, a project from our Green Team.